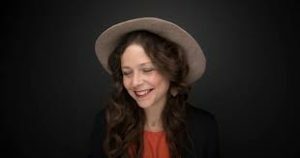 Some people might call May Erlewine ‘Michigan’s Songbird’, but her songs have travelled far beyond her home state. One of the most prolific and passionate songwriters of her generation, May’s music has touched the hearts of people all over the world. Her words have jells solace for weary hearts, offered light in the darkness and held a lot of space for the pain and joy of being alive in these times. When she starts to sing, welcome to the moment. May was raised in a family rich with art and music. She began writing songs and playing them for people at a very young age. Her journey has taken her all over the world, from street corners to renowned stages. Her songs show a real connection and concern with everyday folk. She pulls from a wide variety of sounds and influences to create her own musical landscape. You will hear traditional folk and roots, soul and rock and roll, but she is mostly inspired by the hearts of the people and the one in her chest. This music is about feeling and telling life’s stories. May sings plays guitar, piano and violin. Since the beginning her career in the early 2000’s she has released fifteen albums, either as a solo artist or with her husband Seth Bernard or with The Sweet Water Warblers (Rachel Davis, Lindsay Lou and May). Her new record ‘Mother Lion’, produced by Tyler Duncan, is probably her best. It is expansive, atmospheric and beautiful. She can front the Motivations, her seven piece band and ignite the dance floor, or play a solo song writer set to a silent, teary audience. Whether it is a solo performance or with a team of excellent musicians backing her, every show is truly magical. This will be May’s first UK tour under her own name. In 2016 she toured is the Sweet Water Warblers, in what was a successful set of concerts. She will be accompanied on this tour by Charlie Muench (of the Stray Birds) on bass and PJ George (from Lindsay Lou’s band) on drums. Support will come from Nashville singer song writer Michael Logen. Michael last appeared at Town Hall live in 2017 with Jenn Bostic and Sarah Darling. Michael’s songs have been covered by the likes of Kelly Clarkson and Paul Carrack and have featured on many US TV programmes. Error: Error validating access token: Session has expired on Saturday, 23-Mar-19 02:32:21 PDT. The current time is Thursday, 25-Apr-19 19:17:52 PDT.